Beard Vape Co No. 00 E-Liquid - Money Off! Everyone knows coffee and tobacco are a match made in heaven. The Beard Vape Co No. 00 E-Liquid emulates this flavour, resulting in a deliciously sweet and smoky e-juice. Beard Vape Co began in the back of a shop in California with a row of 100 numbered bottles ready for sampling. Chosen by the public for their flavours, the numbers stuck for names and No. 00 was one of the top flavours that made it through to production. No. 00 E-Juice is available in 10ml bottles and four different strengths. All are supplied with a child-proof applicator. Some of our stock of the Beard Vape Co No. 00 E-Liquid is nearing its expiry date and, in light of this fact, we are offering the affected stock for a discounted price of £3.59. Act quickly, as this offer is only available while stocks last! No. 00 is the combination that everybody craves: sweet, creamy cappuccino with a smoky and dark tobacco. Feel like you're on holiday sitting outside a cafe on a baking day, smoking a cigarette and drinking a cappuccino to begin your morning. Such bliss. 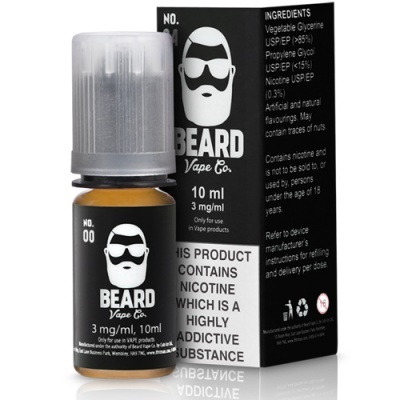 Number 00 E-Liquid is supplied in 10ml bottles only.